Mod. 027 ladies dance shoes width F regular width Latino heel 5 cm black Nubuk synth. Mod. 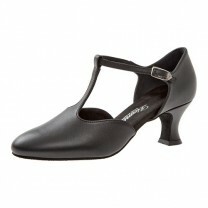 035 ladies dance shoes width F regular width Flare heel 6,5 cm black Nubuk synth. Mod. 052 ladies dance shoes width H extra wide with comfort foot bed Spanish heel 4,2 cm black suede. Mod. 053 ladies dance shoes width F round form Spanish heel 5,5 cm black leather. Mod. 075 ladies dance shoes width E½ regular width Latino heel 5 cm black suede. Mod. 102 ladies dance shoes width F regular width Latino heel 5 cm black Nubuk synth.